Lizzie Biscuits: Many people have such a definite idea of what Star Wars is. Do you find that restricting or inspiring? 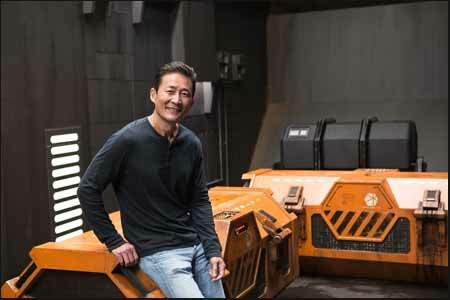 Doug Chiang: Expectations are always so high! Working out a design for a Star Wars film is really daunting. We’re fans ourselves and we always try to create imagery that would wow us. What was great for me is that we knew we were founded in Episode IV aesthetics and that’s something I’d wanted to do my whole career of designing for Star Wars. There’s certain imagery I always want to see in a Star Wars movie and, depending where the story goes and what the screen play is I always try to infuse some of that in there. Sometimes we don’t know what the screenplay is going to be, we have glimpses of the outline but we don’t have all the details. Our job as designers early on in the process with the story team is to create inspirational images which can maybe inform the writers as well. For me it’s trying to set the visual bar as high as possible. This period is really fun because although the Star Wars universe is really expansive there are strict guidelines and I like to live right on that edge where you can push something as far as possible but them sometimes you realise oh no, no no you pushed it a little bit too far and that is no longer Star Wars. What I enjoy is that there is always a component in Star Wars design that is something new. For example when you think of Empire… Cloud City was such a bold statement but if you put that in context with what you just saw in Episode IV it doesn’t make sense, it’s so different to what you saw in that first universe. That’s something I really liked about the Prequels, you were all trying to create something new and expand the universe, it’s a shame that wasn’t as well received as these more recent back-to-the-old-days style films. Thank you for saying that, I love hearing that people like the Prequels. I find Star Wars a very generational thing. I grew up with the classic trilogy, my favourite films are IV, V and VI but I had a great part in I, II and III and my kids love those films MORE. Which is good. Star Wars is an expansive universe. You might not like everything in it but it’s all Star Wars! It must be an interesting challenge recreating this older, let’s say “analogue” aesthetic but using such advanced digital technology. Absolutely, you’re spot on, The question is how do we update classic design so that it holds up to modern cinematography? If you go to the Lucasfilm archives and look at the original costumes and the original builds they’re actually quite crude y’know. Because George had very limited resources... but our memory of them is something else. So what we tried to do for our film is to rebuild that memory. A real delicate balance of remaining true to the original vision but you do have to update. The modern audience has got so much more sophisticated. If it looks cheap they’ll read it as false. So we asked ourselves “what would George have done if he had the resources?” Things like the stormtroopers we updated so that they looked like they were manufactured armour versus just vacuum formed plastic. The Star Destroyer bridge George had built a partial set for and we had the original plans. So we matched our design to that exact plan. On a larger scale it’s interesting because you’re now able to recreate worlds in their entirety so our approach was to try and have some restraint in that. To try and go back to the 1970s and ask well okay, if George was doing this how would he have done it? What kind of sets would he have built? The main difference is now we can show MORE of the sets. And the whole planetary geography, seeing worlds like Lah’mu, Jedha and Scarif so completely even in only a little screentime was mind blowing. They are some of the things as a film designer I really love, building complete visual worlds that tie into the story. A lot of the homework that we do never makes it onscreen, we figure it all out and the directors will come in and cherry pick the elements that fit the story that they want to tell. I like to create inspirational images, to create imagery that would really inspire us as fans. Even if they might not end up in the movie. Can you tell me about any of those or are they SUPER SECRET? Ha ha They are very secret but one I can share... In the original draft of the script there was going to be Dantooine base which was referenced in IV but never seen. We did quite a bit of design about what that could actually be but unfortunately the final screenplay didn’t have that environment. It was still really fun to explore all those elements that we know could fit. Thank you for talking to me Doug, one last question. Do you doodle and if so what do you like to doodle? Oh I do and I doodle Star Wars designs, crazy as that sounds. I live and breathe Star Wars 24 hours a day. Rogue One: A Star Wars Story is out now on Blu-ray, DVD and Digital Download.